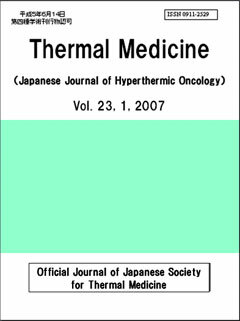 The journal of “Thermal Medicine” is the official journal of the Japanese Society for Thermal Medicine (JSTM). The journal contents will include Original Papers, Short Reports, Technical Reports, Case Reports, Reviews, and Letters to the Editor. Articles will be related to thermal sciences in the fields of medicine, biology, physics and medical engineering. The editors hope to publish papers of high quality and interest, so are requesting that the Authors avoid submitting extremely preliminary reports and manuscripts. When the submitted manuscripts require an extensive amount of editing for grammar and composition problems in English, they will be reviewed by scientists who are native English speakers. However, if extensive English editing and revisions are necessary, the costs must be borne by the Authors. When submitting manuscripts to this journal, it is expected that the authors will not simultaneously submit their manuscripts to other journals. Submitted manuscripts should use Word and Power Point formats, and should also be sent as their documents via e-mail. All manuscripts should contain: title; authors names without advanced degrees included (i.e. MD, PhD, etc); institute (complete institute name); institute address; key words (5 words or less); running title (40 letters or less); corresponding author with an address and e-mail address; abstract (300 words or less). The format of the papers should contain: introduction; materials and methods; results; discussion; acknowledgements; references; figures (and figure legends); and tables (and table legends). Cited papers should be indicated as a single number1) or multiple numbers1, 3-5) in superscripts. All lines should be double spaced. Chemical names should be written using International Union for Pure and Applied Chemistry (IUPAC) notations. Biochemical terms and the names of enzymes should be written using International Union of Biochemistry (IUB) notation. When chemical and reagent names are listed, the complete names along with the manufacturing company’s name, city, and country (or state if the reagent is from the USA) should be written the first time a reagent is mentioned. Articles submitted to the journal should fit into one of the following categories: (A) Original Papers should be about 10 pages, including Figures and Tables, in their final printed form; (B) Short Reports, Technical Reports and Case Reports should be about 5 printed pages in their final printed form (including figures and tables); (C) Reviews should be about 10 printed pages in their final printed form; (D) Letters to the Editor should be about 2 pages in their final printed form. 3) Tamamoto T., Takahashi A., Ohnishi K., Ohnishi T.: Heat-induced growth inhibition and apoptosis in transplanted human tongue carcinomas with different p53 gene. “Advances in Hyperthermic Oncology 2000”. Ed. R. Tanaka, Kosoku Printing Co. Ltd., pp.63-67, 2000. If authors request a correction or retraction of a publish article, the corresponding author of the article should obtain approval from all coauthors prior to submitting a request for a correction or retraction. The corresponding author should submit a written statement explaining the reason for a correction or retraction to the Editorial Office. The final decision for a correction or retraction will be made by the Editor-in-Chief. In the case of a correction or retraction of an article, the written statement explaining the reason, together with the bibliographical data of the article, will be published in the latest issue of our journal. 2) Tamamoto T., Takahashi A., Ohnishi K., Ohnishi T.: Heat-induced growth inhibition and apoptosis in transplanted human tongue carcinomas with different p53 gene. “Advances in Hyperthermic Oncology 2000”. Ed. R. Tanaka, Kosoku Printing Co. Ltd., pp.63-67, 2000. 3) 高橋昭久: 温熱による分子損傷. “ハイパーサーミア－がん温熱療法ガイドブック－”. 編集. 日本ハイパーサーミア学会,毎日健康サロン, pp.126-127, 2008.